Click the links below to read the full text. Commander Kevin Ford aboard the International Space Station answers 14 of Kline School students' questions about being in orbit. Kids at this school www.klineschool.com get to chat with the ISS today. How cool is that? 11 am PT live! Costa Mesa kids will get about 10 minutes to chat with Commander Kevin Ford aboard the International Space Station, barring technical difficulties. National group recognizes Costa Mesa Sanitary District for giving schools, including Kline, money for collecting old phone books, which are then recycled into new ones or phone bill return envelopes. Meet trailblazer Liandra Mendonca da Silva, 10, who lives in the Amazon Basin and attended 4th grade at Kline School in collaboration with the Amazonian Ecological Preserve, whose foundation is dedicated to the preservation of and education about the rainforest. 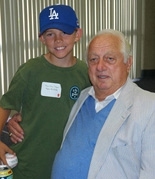 Former L.A. Dodgers manager and Hall of Famer, Tommy Lasorda, donated a number of items to auction and celebrated with parents and students at Kline School's annual fundraiser. On Veterans day, Kline School students raise a flag sent to them by U.S. Marines serving in the war in Iraq. For almost two decades, Middle School teacher, Sean Butler, has kept his students on the leading edge of technology. There's even proof! An article featuring his work has been archived in The Los Angeles Times Education Collections Section titled "Smart Resources for Students and Parents".